Le Physique | Vancouver Personal Training | Don’t stretch that! Ever been told by your physio “don’t stretch that!” and that by doing more flexibility-based hot yoga classes that it may be harmful? How can this be? Isn’t being flexible or stretching “good”? Isn’t it something we should all be doing, every day, all day and even in our sleep? When considering one’s flexibility, it is important to understand how the muscle is put together. 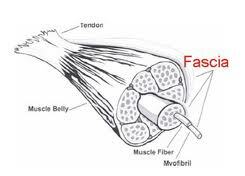 Encasing the muscle is a fibrous structure called muscle “fascia” (much like the casing over a hotdog – the most “famous” fascia you probably have heard of is the plantar fascia and may have even known people that suffered from plantar fasciitis). If this structure becomes over stretched, the result is similar to over stretching an elastic band, causing the fascia to lose its elastic qualities. It is important that while muscles are elastic and flexible, but also that they retain their elastic characteristics, which allows them to remain responsive. This quality in the muscle unit is very important, as it allows your muscles to be able to contract quickly when your limbs are pulled into positions where they could potentially be strained (muscle injury) or sprained (ligament injury). What stretches should I avoid? 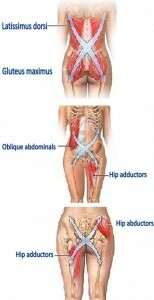 There are number of various stretches that can cause more harm than good. Just because your old school old soccer coach tells you to jump up and down on one leg with the other twisted around your head, doesn’t mean that it is the right way to do it. Generally stretches to be avoided are ones that cause compression of your joints or internal organs, over stretching of your ligaments or any stretches that compress your spine. For example, the hurdler’s stretch (where you sit on the floor with one leg straight out in front of you and your other leg bent behind) can cause strain on the medial ligament in your knee while compressing your knee cap and the disc of cartilage inside your knee called your meniscus. In scenarios like this, it is best to determine if there is instability in the joint through assessing your movement quality, range of motions, and muscle testing – and then find out how to help strengthen, stabilize and stretch! Should I stretch if I’m injured? 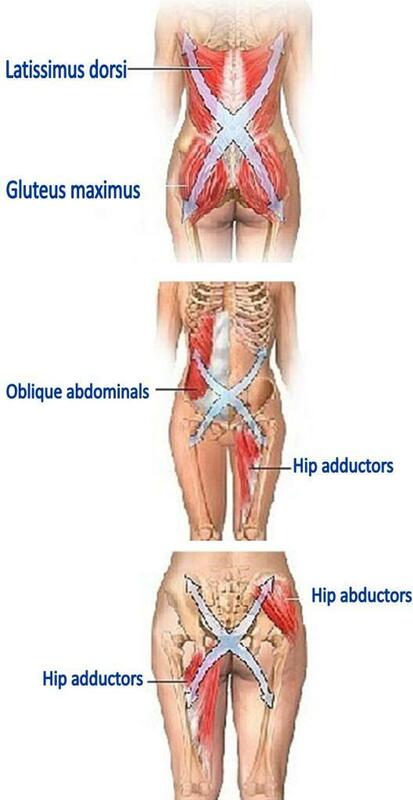 If there is an acute injury or trauma to your muscle, then…(you guessed it) don’t stretch! Stretching a muscle that has been injured by some sort of blow or trauma, can actually cause more damage to the muscle itself. On the other hand, if you are experiencing a chronic issue caused by repetitive strain, then stretching (in combination with rest, mobilization and strengthening) is beneficial. Finally, any stretching that causes numbness, burning, tingling or itching sensations can be a sign of neural issues being triggered. Back off the stretch and bring the intensity down to a level 2/3 on the RPE scale. However if this is something that you’re experiencing on a consistent basis, even when the stretch is gentle, or a new symptom, we strongly recommend working with a physiotherapist in order to have everything checked out (this isn’t normal!). So while stretching and improving flexibility is for everyone, be aware that there are different types and TIMES (in your life, and during the day) that stretching would be perfect for you. There really is no cookie cutter flexibility program that exists, and even if you had an identical twin, likely your stretching program might be similar, but not exactly the same! Explore different stretches, do what feels good for your body, and if you’re feeling really up to optimizing your flexibility and overall health, let us help you develop the right program for you! We LOOOVE this kind of stuff! Stay tuned for blogs on doing the splits and how to combine relaxation and achieve ultimate flexibility!